The 14th World Scout Jamboree was held July 29 to August 7, 1975 and was hosted by Norway at Lillehammer, on the shore of Lake Mjøsa. King Olav V and Harald V of Norway, who then was prince, opened "Nordjamb '75", as it became popularly known, in the presence of 17,259 Scouts from 94 countries. The slogan was Five Fingers, One Hand, an example of international cooperation on the part of the five Nordic countries responsible for its organization. The British contingent, led by Robert Baden-Powell, 3rd Baron Baden-Powell, included Scouts from Branches in Bermuda, Hong Kong and Rhodesia. 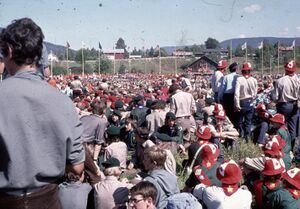 The program of this Jamboree included excursions in the mountains by international patrols, activity areas, Nordic trail, choir, visit to Maihaugen cultural museum, and the Jamboree Country Fair. The relationships that developed were in large measure due to the warm hospitality given to almost every visiting Scout in the homes of the hosts. This Jamboree included in the program several activities involving modern technology, as well as traditional pursuits such as hiking, orienteering and camping. The Jamboree was also visited by Carl XVI Gustav of Sweden and the Crown Prince of Morocco. The campground was located on shore of the river Lågen where it enters Lake Mjøsa. On August 2, 1975, the Jamboree County Fair was celebrated. For this event there have been issued Nord Crowns as Camp currency. This page was last edited on 11 July 2013, at 12:31.